You’ll be happy to know that I am now showered and have on clean clothes. I first put on the black and white nursing tank and orange jersey shorts, um, on Saturday night? Or maybe Sunday? I don’t remember. But it’s Tuesday now and I only just took them off. This is what happens sometimes when I’m at home, when our window-AC unit barely cools parts of the house below 80 degrees, even at night (ok in the early morning hours, it maaaaybe gets to 75), I have two young kids at home, and with no car – or desire – to go anywhere. And also when I’m spending every free moment writing and compiling all the documents necessary to file a provisional patent application. But I’m done now. I submitted it all a couple hours ago. Hm. See, well, so here’s the deal. I’m really nervous about this whole intellectual property thing. At the end of last year, KP discovered that someone he had known, trusted, and who’d had access to many of his projects/scripts had written their own script – with the EXACT same story line as his, with only a small character change – and was passing it around town as their own. And they received praise and recognition for it. Basically, this person stole his script, changed just enough details to evade a lawsuit, took credit for it, and on top of it all, was praised for it and placed on a list of “best new scripts” (or screenwriters, or something like that). If you’re my facebook friend, you may have noticed a couple vague and extremely disheartened status updates from me in December sometime – this is what I was referring to. At this point, it’s done and over and all I can do is hope that the person who (very knowingly) wronged KP will someday be held accountable. It is out of my hands and into karma’s. But I am still very hurt by the experience. And I hate that I lost a little bit of trust in mankind because of it. This now brings me to my invention. Hey, this is something I think I’ve invented. I do want to file a regular, full patent on it, but it’s gonna take me some time to test it and put together the full patent application. But in the meantime, I’m officially stating on record that, as of today’s date, this is MY idea. If someone comes along later and wants it for themselves, too bad – this is what I thought of and I thought of it first. 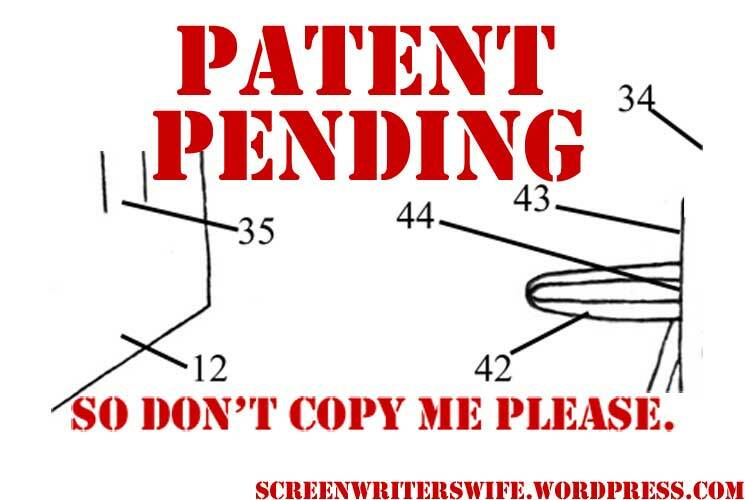 But I do promise to file a regular patent within a year. I promise. Or else I won’t ever be able to get a patent on this invention. That’s where I am. Patent Pending. I am now free to make and sell my invention and if someone else wants to try to copy me, well, they can, but it’d be dumb for them to, because I put in my paperwork first before them. Nanny nanny boo boo. But really, “patent pending” doesn’t mean anything other than sounding scary to would-be competitors to keep them away. See Related Post: It's the latest and greatest best idea ever! Some of you are probably staring daggers into me through the computer screen right now. Am I going to tell you my invention or not?? You can’t take the suspense much longer! b) somehow, someone will find this on the internet (my blog’s public afterall) and think up a better version of my idea and pass it off as their own. It’s happened before, and sadly some people don’t have the same moral compass as I assume most of my readers do. Stealing is wrong, folks. Once I test out my product more and feel more and more confident (and if/when I’m ready to sell 🙂 ), I will divulge the full details though, don’t you worry. 1) Though Baby S is starting to find his fingers, I am strongly encouraging his pacifier habit to continue, just so he can keep being my guinea pig. 3) The little snippets of the above image are two small pieces of two of my actual application drawings. « How quickly time passes.